In the face of fish kills, foot and mouth disease, melamine-tainted imported foods, viral-stricken fowl, Filipinos should find comfort that here, nutritious and vitamin-laden foods still grow abundant everywhere in the country and can readily be planted in their backyard. These are the cassava and moringa or locally known as malunggay. An average of 26 typhoons visit the Philippines each year. In addition to these natural disasters, there are man-made conflicts that affect many Filipinos in the countryside. In instances of calamities, emergencies, and spur of the moment necessities, reserved food is needed. It should be food that is nutritious, palatable, inexpensive, readily accessible, and will not require fussy cooking. All these qualities could be found in the lowly cassava and the malunggay that springs from the earth when a branch is stuck in the ground. Lourdes Montevirgen, a food scientist from the Department of Science and Technology, made a presentation on reserve foods for Filipinos in one meeting of the Management Association of the Philippines not too long ago. 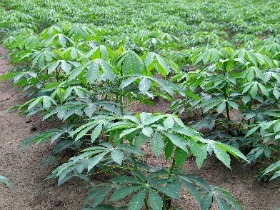 Montevirgen asserts that cassava is a crisis crop. It is staple food for more than 500 million people. In times of war, drought, or low national income, consumption increases relative to alternate food staples like maize, rice, wheat. The plant, Montevirgen claims, can remain buried in the ground for up to three years prior to harvest thus providing an easily maintained food reserve. It adapts to a wide range of growing conditions, soil types, and fertility levels. It is able to yield on soils of extremely low fertility and is often grown where other crops wilt or become stunted. It should be promoted as an important staple food that can spur rural industrial development, increase local work opportunities, and raise income of producers, processors, and traders. Cassava could be a value added agricultural product turned into flour, foods snacks, cooked leaves, boiled fresh roots, animal feed, alcohol for chemical industries, glue, starches for strong textiles and paper, and industrial sweeteners that are easily marketed here and abroad. Marketing should broaden the recognition of cassava in its important role of providing food security. It is the primary reserve food in times of calamities. On the other hand, moringa or malunggay could be considered a wonder plant – its unassuming rounded leaves are powerful tools to combat global malnutrition. It is called the miracle vegetable since it contains all essential amino acids to build strong and healthy bodies that are rare for a plant source. Montevirgen also said that Reserve Food for disaster management is necessary because in times of disaster, more often than not, there will be no access to food for days and even weeks. Basic services (like water, gas, electricity, communications, transportation, etc.) may be cut off, and perishable food will not last.